Profile: Living in the country I cannot ignore the seasons and the consequent transformation of the landscape throughout the year. This influences my work and referring to landscape studies in my sketchbook and the marks and brushwork of my life drawings, I work intuitively on forms developed from organic sources. 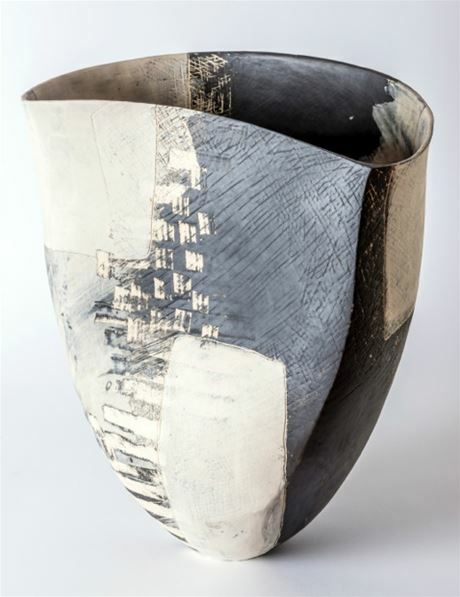 Responding to the material, enjoying the rhythm as I move around the form, I make marks of depth and variation, scratching and scraping through layers of slip, revealing the clay and emphasising the dryness of engobe or the softness of burnished slip; the silky surface emerging as polished as a sea worn pebble. I work spontaneously, creating forms and surfaces that evoke the feeling I have when I am part of the landscape, not illustrating it but striving to convey nuance of shape, balance and mass and creating mood and atmosphere.